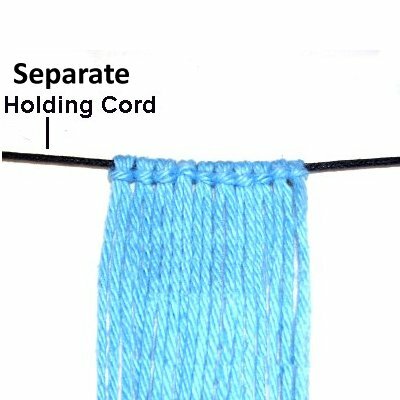 The Cord Measurements you make for Macrame include determining the number of cords you need, their lengths, and the total amount of material to purchase for your project. You create a design on your own without a written pattern. 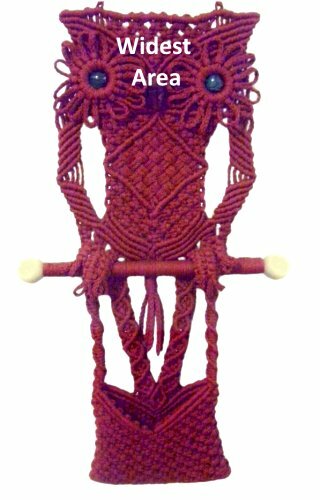 You make any changes to a Macrame pattern. Important: You should make all the measurements and calculations BEFORE cutting any material. Write down the result for each step in the process described on this page. 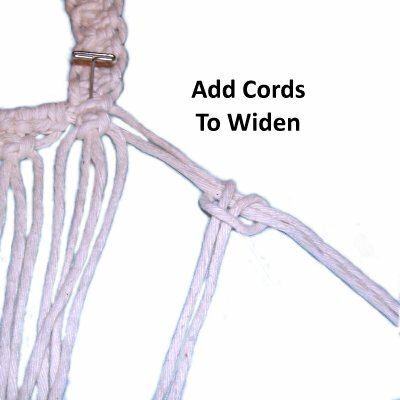 Here are some basic math conversions you can use for cord measurements, and to understand the patterns on this site. The information below describes the process you must follow in determining the WIDTH of your project when it's finished. The cord measurements and details you get in steps 1 - 5 will determine the number of cords to cut for your project. You must start by calculating the finished width (side to side) you are aiming for, in the widest area. This is the Owl Pouch. The widest area is at the top, where the cords are mounted. Use a tape measure to decide the width you want, then write that size on paper (in inches). 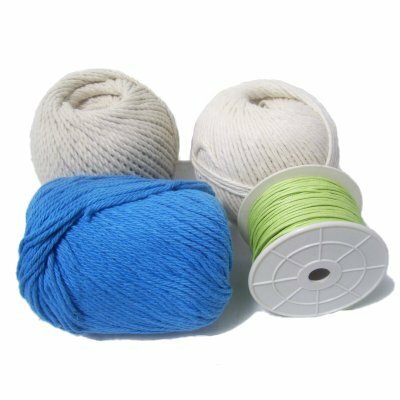 You MUST know the actual size of the cord material in millimeters, which is the width from edge to edge. You should always measure the material before using it, since labels can be inaccurate. 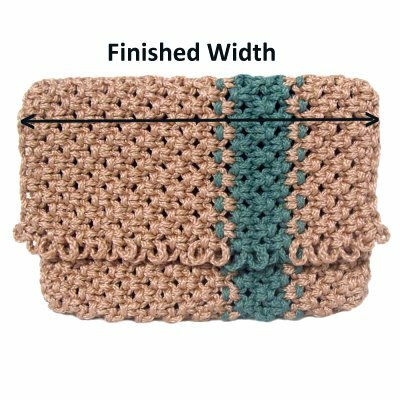 Important: When making changes to a pattern by using a different size material, the finished width will increase or decrease. You may need to change the number of cords, or the overall design, to keep the size the same as the original pattern. This is the Striped Clutch, which is an old pattern I decided to alter by changing the material size from 6mm to 4mm. I had to increase the number of cords used in the design so the width stayed the same. 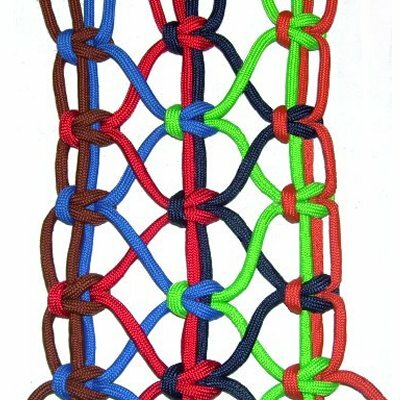 The specific Macrame knots you plan to use for your design, and how many cords are needed to make them. Remember that you can add (or subtract) cords if necessary. Decide now if you plan to mount ALL the cords at the beginning, or if you want to start with a few, then add the rest later. Determine if you need extra cords for clasps, certain knots, or if you will be adding more cords to widen an area. 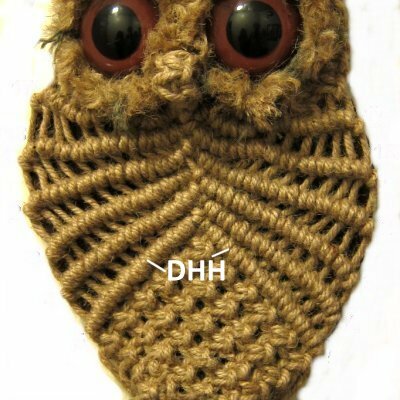 Example 1: The All Natural Owl's wings are made with Double Half Hitches (DHH), which have two loops that rest side-by-side. 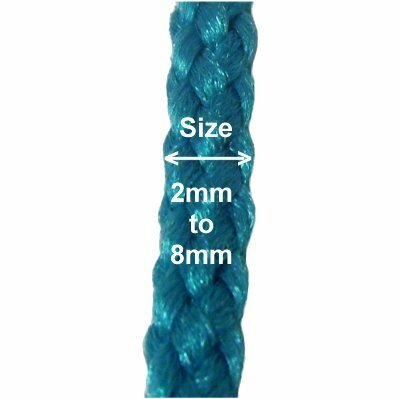 When tied with 6mm size material, both loops will measure 12mm, which is approximately 1/2-inch. 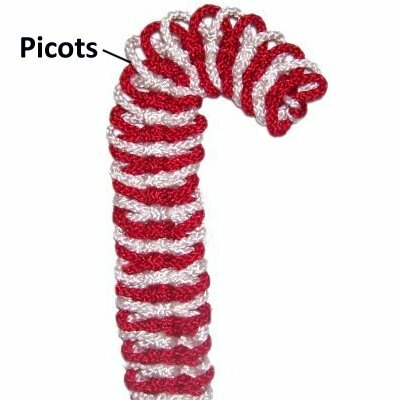 Example 2: This Candy Cane was made with Square Knot Picots, which are loops that stick out on each side of the knots. They can be made any size, so you would need to write down how wide you plan to make them. You need to know the circumference of the rings you plan to use for the design, in order to make these cord measurements as accurate as possible. Measure across the center to get the diameter. Diameter x 3.14 = circumference. The Fringed Table has three rings at the top in different sizes. In a case like this, you need to know the circumference of EACH ring. 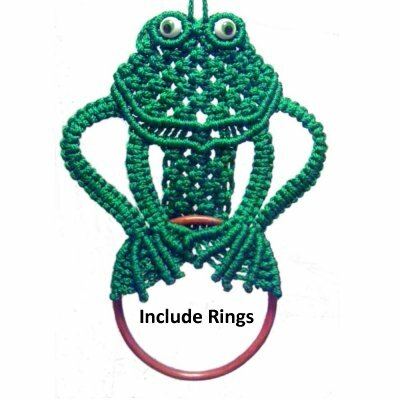 The main thing you need to consider when using rings is that you can only tie a certain number of knots onto a ring, before you run out of space. It's possible that you may need to add cords to cover rings, especially if they increase in size. Mounting the cords to a ring, dowel, or other cord is done at the beginning of the project. You MUST know if the cords are to be folded, since this will affect your cord measurements for both width and length. When making Buttonhole clasps, you start out with the cords straight, beginning the knots in the center. 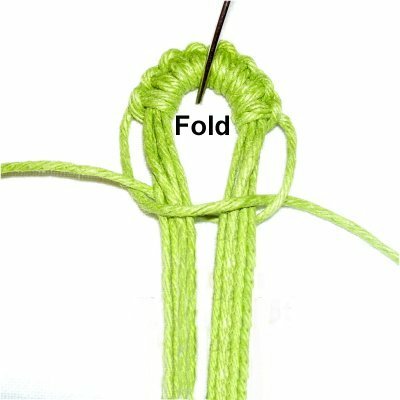 Then you fold the knots to form the clasp. Folding at any point in the design usually means you need to cut fewer cords (1/2 the amount). Now it's finally time to determine how many cords you need to cut, which is based on the cord measurements and information from steps 1 - 5. The PRIMARY cords are the ones that make up the majority of the design. Step 6A: Multiply the Finished Width (from step 1) by the number of cords shown in the table below. The quantity depends on whether they are folded (see step 5). Finished Width = 10 inches. For 6mm material, you choose 2 cords per inch, since you want to fold the cords during the mounting process. Multiply 10 x 2 = 20 cords. Step 6B: Divide the total number of cords by the quantity you need for the specific knots you plan to use. The result must be a whole number (not a fraction). Make adjustments to the quantity as needed. Alternating Square Knots require 4 cords per knot. In your design, there will be 40 cords to work with after mounting, since you plan to fold them in half. Divide 40 by 4 = 10 (whole number). That means you have the correct amount of cords to make Square Knots. Step 6C (optional): Now you need to determine if the total number of cords will fit on the rings, if you plan to use them. This is based on the type of knot used to attach the cords to each ring. Important: This step DOES NOT apply to a ring where you simply fold the cords without using knots, like at the top of a plant hanger. Designer's Tip: Sometimes you can fit more knots on a ring if the material is flexible and the knots are very tight. So don't be afraid to try a smaller ring size than your cord measurements suggest. Double Half Hitches are used to attach the cords to the ring. They are each made with 2 loops. Using 6mm material, each cord will produce a 12mm knot (1/2-inch). Multiply 40 by 1/2-inch = 20 inches. The result is close enough to the total area on the ring that you should be able to get all the cords on. Keep in mind that flexible materials may require you to add more knots and/or cords, since they grip the ring more tightly. Here are common situations where you need extra cords. Be sure to write these all down on paper separately, since they are likely to have different cord measurements than the primary cords. Widening: Look at your design plan/drawing (step 3) to see if you will be adding cords to widen an area. Rings: When increasing ring sizes, you may need to add more cords to the larger ring. Also, you may need a cord to wrap a ring, which will be a different size than the others. Holding cords: Write down any SEPARATE holding cords that you will need to add (not primary cords used to hold knots). Extra cords for certain knots: Wrapped Knots and Sliding Clasps require cords that are shorter than the others. 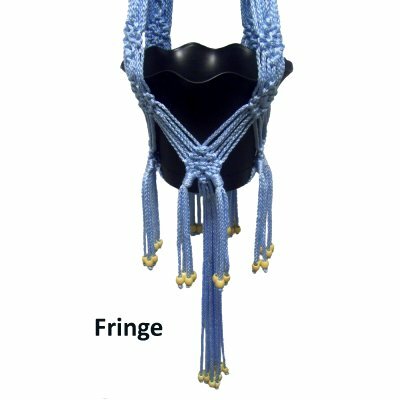 Fringe: Certain types of fringe require separate pieces of material, which you need to determine. You may be able to use scraps instead of cutting these from the roll, if the fringe is short. Now it's time to determine the cord measurements for LENGTH. You should have several groups of cords written down, such as primary cords, holding cords, extras, etc. You need to make the calculations for each group, keeping them separate from one another. These cord measurements include the finished length, the length of the primary cords, and the length of the remaining cords. The finished length is the size you are aiming for, from top to bottom (or end to end). When I made the Fringed Table, I wanted the finished length to be close to 72 inches (183 cm) from the ring at the top to the bottom of the fringe. The finished length is used to calculate how long you will cut the primary cords for that project. The following cord measurements should be made with a flexible tape measure or ruler. Write down the results on your paper. 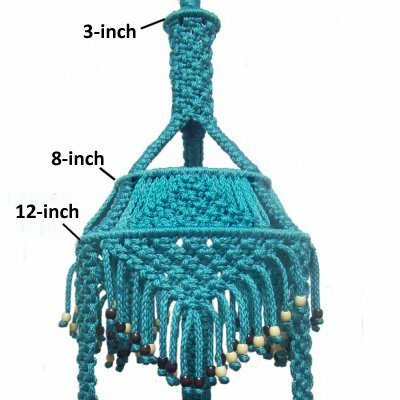 The details shown below are for the most popular types of Macrame projects, just to give you some basic guidelines for length measurements. These guidelines won't apply to every project. Just do your best to determine what you want the item to measure when it's finished. Run your tape measure from the hook in your ceiling down to where you want the pot or table top to rest. Make sure to include any fringe you plan to make at the bottom. Measure the actual position on your wall where the item will rest. Be sure to include any rings, fringe, etc. that will add to the overall length. Measure the area where it will rest, near your hips or waist. Add extra length if you plan to make a tie to secure it, like in this Window Belt. 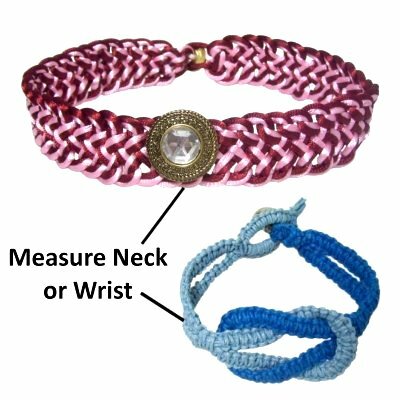 Measure all the way around your wrist if you are making a bracelet. Measure around your neck (closely) if you are making a choker-style necklace. 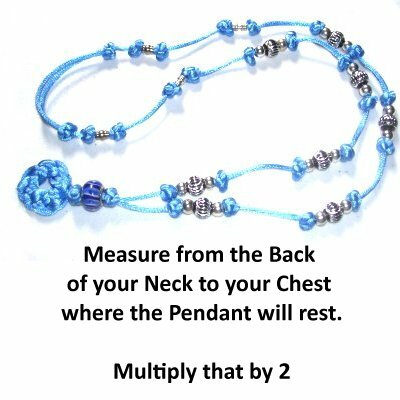 Measure from the back of your neck to the area on your chest where the pendant will rest. Multiply that by 2 to get the finished length. Look at your knotting plan to determine if the pattern will have an open weave, or if the knots are resting close together. Choose the most appropriate cord lengths, described in Designs A - C (below). An open weave is a design where the knots are separated by more than 1-inch, so there are areas without any knots. This also applies to projects that have only a few rows of knots, followed by a long fringe without knots. 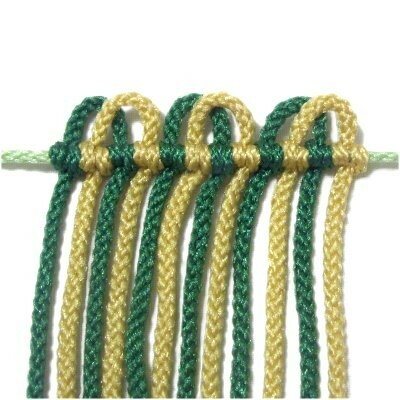 Simple braiding is considered an open weave because there are no actual knots, the cords just cross and fold. 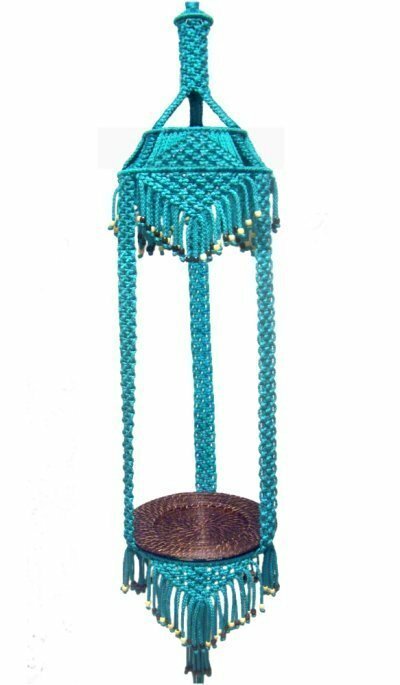 This applies to Macrame designs where there is up to 1-inch of space between the rows. 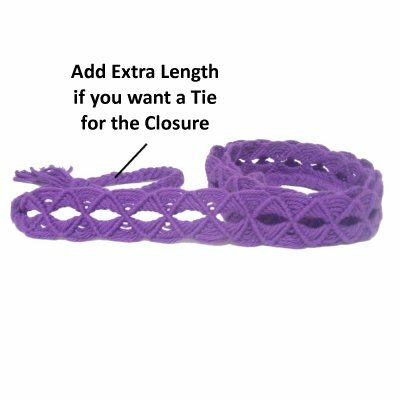 Multiply the finished length by 3 if the open weave is 25% to 50% of the overall design. This applies to designs where the knots rest close together. Multiply the Finished Length by 4. 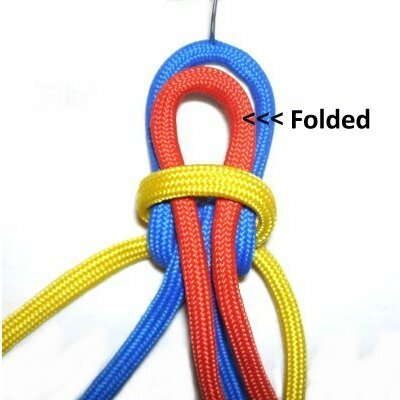 Certain types of knots are complicated, with many folds. Chinese Button knots, for example, require more material than other knots. 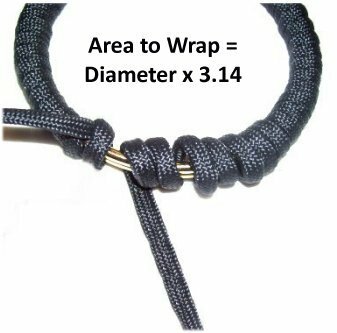 Determine the number of complex knots in the design, and multiply that by 5 inches. 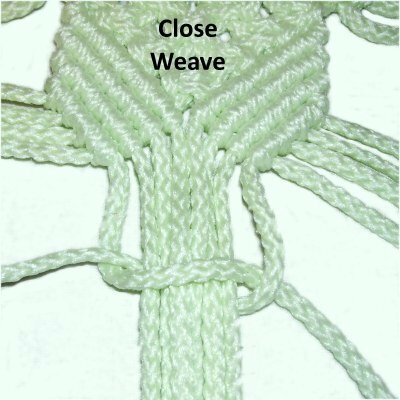 Complex knots, continued: Determine the length of the cords based on the information for Design C above (closed weave), then ADD what you need for the number of complex knots. 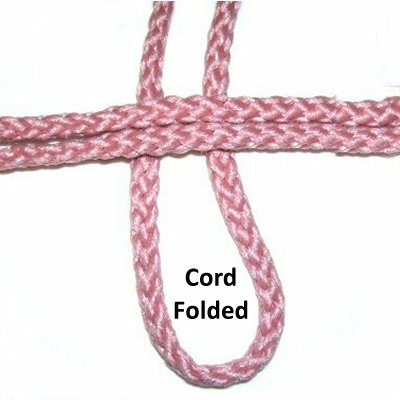 Cord are often FOLDED to form loops. 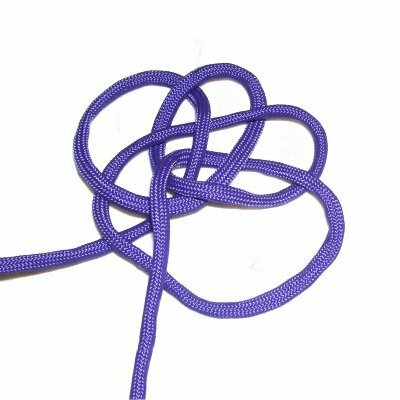 Sometimes a knot begins by folding one or more cords. This includes picots, as shown in the next image. Your cord measurements MUST take any folding into account, or they won't be accurate. Double the length if the cords are folded at any point in your design. In step 7 you wrote down several types of added and/or extra cords. The cord measurements for each type needs to be calculated individually, depending on where they are placed and why they've been added. The most common situations are described below. Holding cords that are NOT USED to tie any knots should be at least the finished length + 8 inches. Double the length if the cords are folded. When holding cords are used to tie knots, they should be the same length as the primary cords (step 9). The cord measurements that apply when adding cords to widen an area depend on where they are placed. Mentally divide your design into three parts -- top, middle, and bottom. Top Area: Same length as primary cords. Middle Area: 1/2 the length of the primary cords. Bottom Area: 1/4 the length of the primary cords. 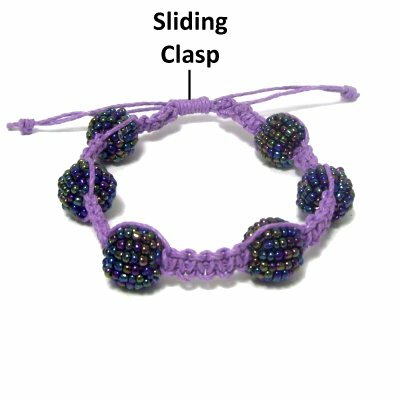 Sliding Clasps made with knots require at least 18 inches of material. Saving scraps and remnants will provide you with the short cords you need, so you should always keep the longest pieces. 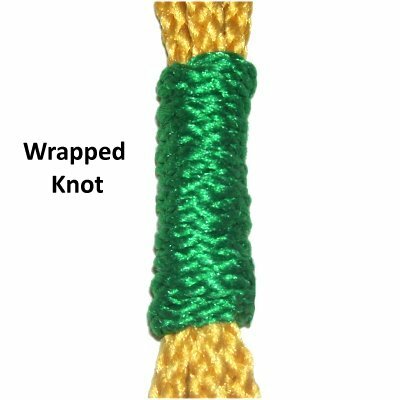 For Wrapped Knots 1.5 inches tall, use a 36-inch cord. The cord should be 45 inches long if you plan to make a 2-inch knot. To wrap a ring, multiply the diameter of the ring x 3.14 to get the circumference (total area to be wrapped). 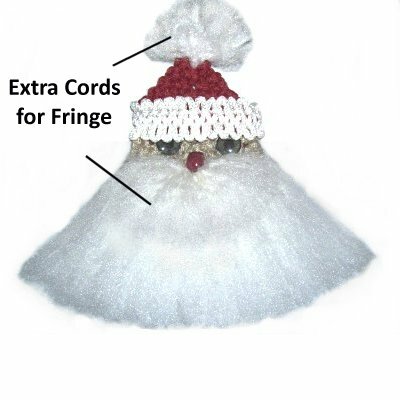 Fringe designs that require extra cords can sometimes be made with scraps. Cut material from the roll if the scraps aren't long enough. The cords should be at least the desired length of the fringe + 4 inches. Double the length if you are folding the cords in half. Primary Cords: Length x the total number you need (in inches). Other Cords: For each type, do the same thing. Multiply the length you wrote down x the number of cords. Divide by 36 to get the YARDS you need to purchase (or by 12 to get the feet). When purchasing Natural Materials like Cotton, Jute, and Hemp, you may need to convert yards to feet. Nylon Parachute cord is also sold by the foot. Metric Conversion: Meters and yards are so similar that you can just use the yard measurement if you find material sold by the meter. Important: Most of the time, the rolls you purchase will contain more than you need. You can save the remnants for other projects. However, there are times when the amount in the roll is very close to how much you need. In that case, you may find the last cord you try to cut is too short. PURCHASE AN EXTRA ROLL. It's always better to have more in case a cord breaks or is damaged. Have any comments about Cord Measurements? Contact Me.